Lois Artis Daniels generously shared several photographs of Corner Line Primitive Baptist Church, a congregation active for about 100 years near the town of Saratoga. 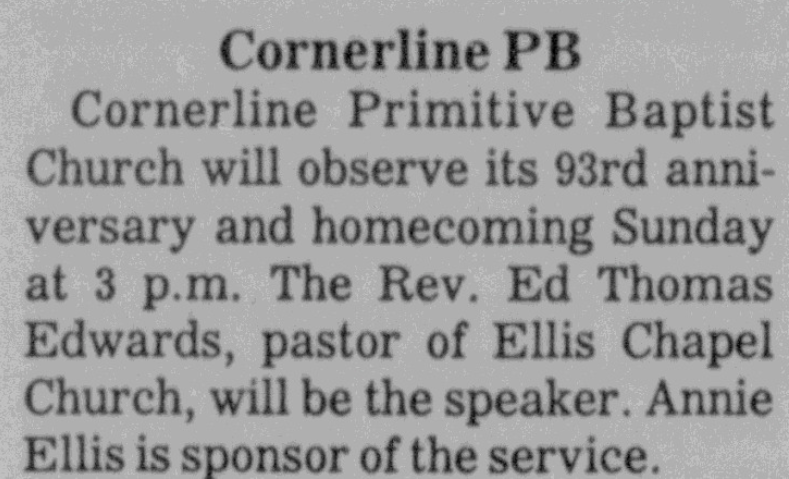 Her great-great-grandmother Eva Ellis Edmundson Barnes was the first of many family members who belonged to Corner Line, and was married to its long-time pastor, Reverend Wiley Barnes. Daniels’ great-grandmother Ella Jane Edmundson Smith was also a member, as were her daughters Geneva Smith Anderson (Daniels’ grandmother) and Bessie Smith Barnes. 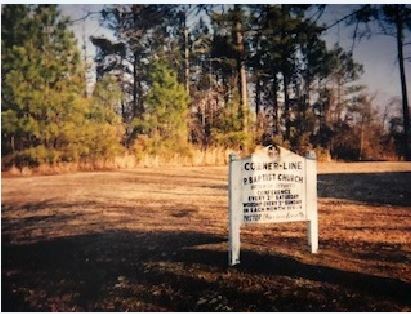 Corner-Line Primitive Baptist Church sign, 1989. 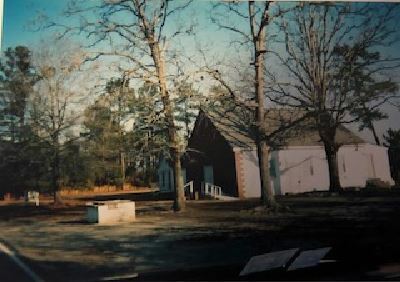 Exterior of Corner-Line Primitive Baptist Church, 2003. 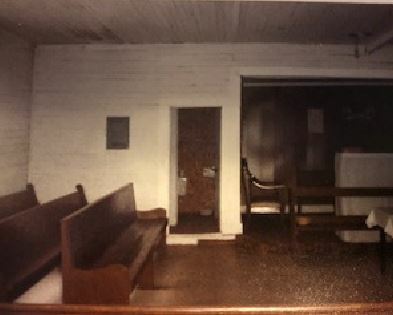 Interior of Corner-Line Primitive Baptist, 1989. This photo and write-up of Corner Line appear in Robert C. Bainbridge and Kate Ohno’s Wilson, North Carolina: Historic Buildings Inventory (1980). On 20 December 1899, Rufus Edmundson, 24, son of Green Edmundson and Rancy Edmundson, married Eva Ellis, 25, daughter of Laura Hudson, at “Few In Number Church” in Township #8. [Township 8? Were they married in Edgecombe County? The license was issued in Wilson County.] Primitive Baptist minister N.T. Johnson performed the ceremony; Louis Hagins applied for the license. In the 1900 census of Saratoga township, Wilson County: farmer Rufus Edmundson, 28; wife Eva, 26; and children Robert, 2, and Alfred, 2 months. In the 1910 census of Saratoga township, Wilson County: on Ellis Road, farmer Rufus Edmonson, 33; wife Eva, 33; and children Ella J., 7, Hada, 6, Sadie, 4, and “son-in-law” [stepson] Robert, 13. On 2 January 1918, Crum Smith, 19, of Saratoga, son of Ed and Annie Smith, married Ella Edmundson, 18, daughter of Rufus and Eva Edmundson, on J.B. Eason’s farm in Saratoga. Rufus Edmundson applied for the license, and Sam Bynum, Isaa Bynum and James Bynum witnessed. In the 1920 census of Saratoga township, Wilson County: farmer Rufus Edmonson, 45; wife Eva, 46; and children Robert, 20, Haden, 17, and Sadie, 15. In the 1920 census of Saratoga township, Wilson County: Crum Smith, 21, wife Ella, 19, and daughter Eva, 1. In the 1930 census of Saratoga township, Wilson County: Rufus Edmundson, 50, and wife Eva, 32. 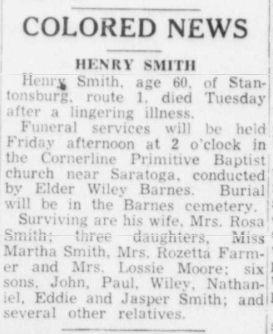 In the 1930 census of Saratoga township, Wilson County: on Highway 91, farmer Crumble Smith, 31; wife Ella, 30; and children Jeneva, 11, Tommy, 10, Minnie, 7, Mary, 5, Bessie, 4, Moses, 2, and Hattie, 1. Rufus S. Edmundson died 13 May 1934 in Saratoga township. Per his death certificate, he was born in Greene County, North Carolina, to Green Edmundson; was married to Eva Edmundson; and was a farmer. Wiley Barnes was informant. Ella Jane Smith died 23 December 1977 in Wilson County. Per her death certificate, she was born 20 August 1903 in Wilson County to Rufus Edmundson and Eva Rice; resided in Stantonsburg; and her informant was Geneva S. Anderson, 1630 Freeman Street Extension, Wilson. Wilson Daily Times, 1 February 1947. Wilson Daily Times, 24 December 1952. Wilson Daily Times, 17 April 1993. 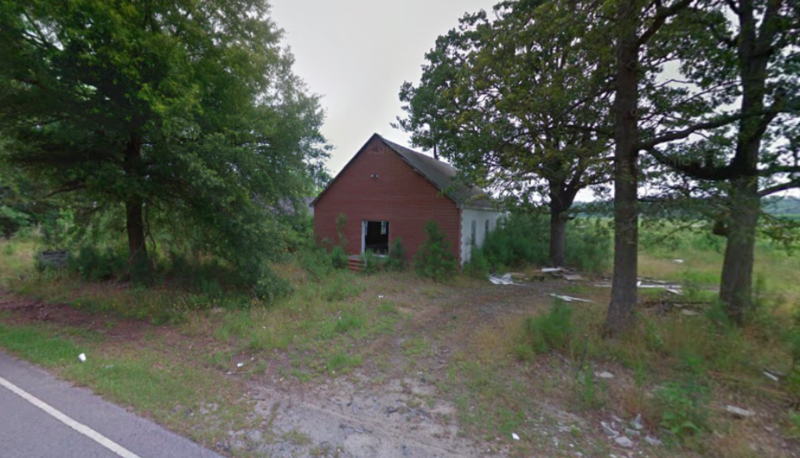 Corner Line Primitive Baptist Church is now abandoned, but still stands on Speight School Road near its termination at Highway 264 Alternate. This Google Maps image dates to 2012. The obituary of Lillie Mae Barnes Edmundson, age 99. Lillie Mae Barnes Edmundson was called home to her eternal rest on Thursday [2 May 2013] at the Wilson Assisted Living. Born to the late Ed and Lula Mae Bullock Barnes in Wilson, North Carolina. She was ninety-nine years old. Funeral service will be held Monday at 11 am at St. James Disciples of Christ Church, 514 Memorial Church Rd., Fremont, NC. The Rev. Tony Sutton will officiate. Interment will follow in Rest Haven Cemetery, Wilson, NC. A viewing will be held Monday from 9:45 am to 10:45 am at St. James Church. The family will receive friends at 408 Whitehead Ave., Wilson, at all times and will assemble there one hour prior to service in preparation for the funeral procession. In the 1920 census of Stantonsburg township, Wilson County: farm laborer Edwin Barnes, 45; wife Lula, 38; and children William, 10, Rosa, 9, Mary, 8, Berley, 7, Frances, 6, Louisa, 1, and James H., 1. On 6 April 1935, Walter Williams, 22, of Toisnot township, son of Joe and Josephine Williams, married Lillie Frances Barnes, 21, of Toisnot, daughter of Ed and Lula Barnes, in Wilson. Witnesses were Eddie Barnes, Joe Williams and Lula Barnes. The Rufus Edmundson House lies just two blocks off Stantonsburg’s main street, but at the very edge of town. Behind it stretch miles of fields and woodland. 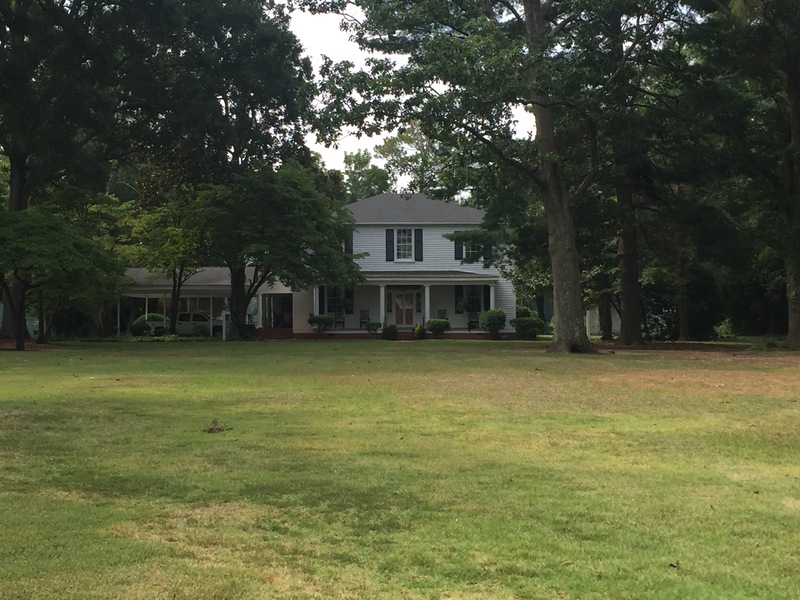 “This antebellum house was built circa 1846 for Rufus Edmundson. … The house is similar to the William Barnes and Ward-Applewhite-Thompson Houses (both in Stantonsburg Township) and the Elias Barnes house (Saratoga township). It stands two stories high and the main block is capped with a shallow hipped roof. Unusual heavy dentils ornament the frieze and the three-bay facade was once sheltered by a double-gallery porch supported by square columns. Although the door leading to the second floor porch has been altered, the original trabeated entrance to the first floor is still intact. A single-story, hipped-roof porch with Doric columns replaced the earlier double-gallery porch in the early twentieth century. On the interior the house is divided by a wide central hall with two rooms to either side. Some original woodwork remains intact including a handsomely curved newel post.” — Kate Ohno, Wilson County’s Architectural Heritage (1981). In the 1860 census of Saratoga township [which included Stantonsburg], Wilson County, Rufus Edmundson’s reported wealth comprised $15,000 in real property and $30,600 in personal property. The 1860 slave schedule parses Edmundson’s wealth — the $30,600 mostly took the form of 34 enslaved men, women and children, aged 1 through 38, who inhabited six dwellings on Edmundson’s farm and toiled for him. The 1870 census was the first post-Emancipation enumeration. Next door to Rufus Edmundson were Margaret and Bailum Hall and their son John, 4 months. (Balaam Hall, son of James Woodard and Liza Hall, had married Margaret Edmundson, daughter of Proncey Edmundson, on 19 July 1870 in Wilson County.) Next to the Halls was a household comprised of members of several families, including Bertha Edmundson, 20, and Winnie, 12, and Gray Edmundson, 14, who were all listed as farmer’s apprentices. Though close proximity and shared surname, as well as indenture as apprenticed labor, do not guarantee that these young people had been enslaved by Rufus Edmundson, these facts are strong evidence. Wilson Times, 21 February 1896. Per their marriage license, Sally Ann Dew, 35, and John Edmunson, 40, lived in Black Creek township. The wedding took place on 9 February 1896. The Edmundson-Woodard House is a historic plantation home located near Stantonsburg, Wilson County, North Carolina. The house is a two-story, three-bay, single-pile, L-plan, Federal-style frame dwelling. It has a two-story wing added in the mid-19th century, side gable roof, exterior end chimneys, and hipped-roof porch with flared columns. It was listed on the National Register of Historic Places in 1986. Wright Edmundson built the house about 1830 on 1400 acres of land between Toisnot Swamp and Contentnea Creek. He owned another 1600 acres north of Black Creek and was one of the wealthiest planters in the area. The Nomination Form for the property notes that Edmundson reported owning $98,600 in personal property in the 1860 census, but glosses over the form of the bulk of that wealth — slaves. The slave schedule that year is more plain — Edmundson owned 62 men and women housed in 12 cabins. Edmundson-Woodard House, 1980. Photo attached to nomination form. The varying surnames of Henry Barden‘s siblings — Nathan Edmonton (probably Edmundson), James Farmer, and Mintus Bullock (gone to Texas) — hint at the disruption of slavery to family ties.